Lantink concentrates on analyzing Wilhelm Röpke’s wartime trilogy, classifying it as a missing link in German social philosophy. The trilogy incorporates patterns of thought that can be found in the cultural pessimism of the 1920s, among others in Oswald Spengler. Their rhapsodic textual form resonates with the “intellectual novel” as conceived by Thomas Mann. Röpke is also compared to Dutch historian Johan Huizinga. Röpke’s social utopia shared with Pierre-Joseph Proudhon both objections to centralism and sympathies for small farmers and artisans. Here Lantink reminds how Switzerland already served as an ideal for nineteenth-century anarchists. 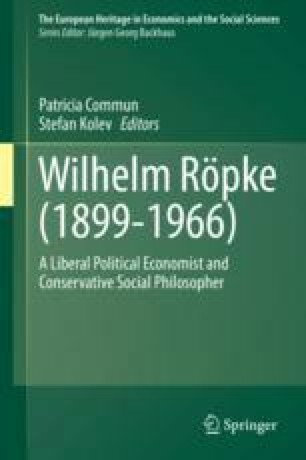 In addition, Röpke’s volumes are compared to the wartime publications of Hayek and of Adorno and Horkheimer. Finally, Lantink explores Röpke’s ideological relevance for the postwar Christian Democratic Union in Germany.